Wood carier - 10 pair of stanchtion. 	Side ladder – left & right – 2 pcs. 	Lift for spare wheel. 	Frame fulfilled riffled metal sheet 5,0 mm. • two corn and grain charging holes in the doors for dumping bulk freight. The excellent quality vehicles manufactured in Poland, covered by TUV Cerifacte !!! *Sells price in ZLOTY - 89.500,- PLN. Euro rate: 1 € = 4,29. NEUES MEGA HOLZAUFLIEGER MIT STAHL "U" RUNGEN AUS STOCK !! 3 Achse BPW / SAF / DCA / Mega - 3 Jahre Garantie !! Knorr-Bremse / Wabco Luft System. Korb für 2. Ersatzräder (verzinkt). Hydraulikschlauche mit Reduzierstück fur 1 - ¾ Inch. Stick an Rollplane am Rahmen befestigt. Jede Preise sind im PLN - Euro Nur Info !!! марка: MEGA, тип: MND 22’5” ЛЕСОВОЗ 10 x ПАР стоек. 1. Ходовая система - 3 годa ! 2.	тормозная система - 2 годa ! 3. Стальная конструкция рамы и кузова - 1 год ! Цена продажи в зл: 89.500,- PLN. 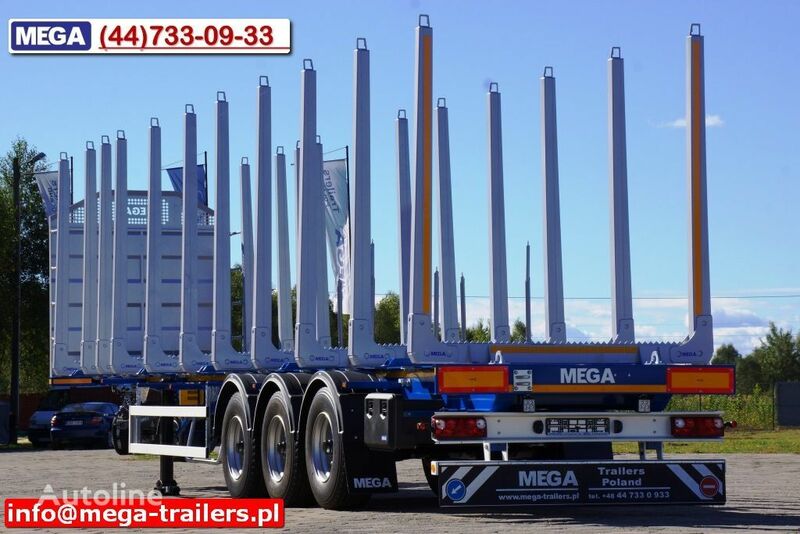 MEGA Trailers Sp. z o.o. Novi MEGA - 3 AXEL WOOD CARIER NEW "LIGHT" MODEL !! 5,9T - READY ! !